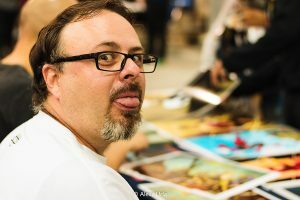 Ricardo Victoria is an academic who loves toys and board games (as do most of us writer types, to be honest). He has written and published several short stories and is about to release his debut novel entitled Tempest Blades, The Withered King. Ricardo was kind enough to divulge more tidbits in this latest round of author berating. Some writers create a bubble around themselves until they’re finished with their project. How true is that in your case? Kinda true, while I can plot scenes, dialogues and whole stories in my head, to put them in paper sor-to-speak, I do need to have my space, preferably alone, and with music. Usually metal opera. I’m not very social. All the time, mostly for scenes for my novel or short stories. I need to take advantage of suffering from vivid dreams and nightmares fueled by years of watching anime, cartoons and cheap SFF TV. Editing my own work. 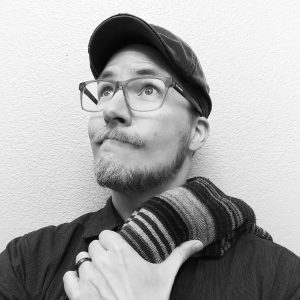 I’m just bad at it and I need extra help to do so. I’m often blind to my own shortcomings when writing in my second language. I need an extra pair of eyes, preferably in another person. The ones in the flask near my desk don’t say much. Given my awful penmanship and my chaotic way to write, a computer is the best. I would put it this way, my handwriting looks like done by a left handed, middle school kid with a broken arm. Or a doctor’s writing, which kinda fits in a way? My upcoming novel Tempest Blades, The Withered King. The only book I have written solo. Now if Hollywood wants to adapt any of my short stories, please be my guest. Seriously, I’m waiting. C’mon! You already made a movie based on Samuel L. Jackson cursing at snakes. My stories are not that outlandish. This would be me preferred cast for my novel’s MC if live action. Alex: for some personal reasons, I’m still undecided about him. If it were an animated feature, it would be the same, but Alex’s voice would be either Paul Rudd or Diego Luna. Yes, I’m a big fan of GoT and assorted Marvel/Disney properties. Still is. A Disney Imagineer. The best place to combine my degree in design, my imagination and get away with crazy ideas. According to my parents, I was mostly a well behaved kid, but prone to question authority. As in organizing protests against my elementary school teacher for repressing us from making questions. 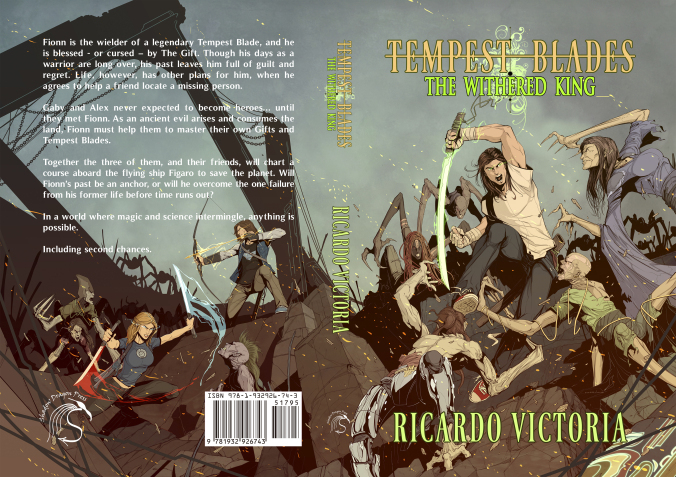 Glad you ask, my first novel, Tempest Blades, The Withered King, will be released in August 20th of this year. Although the book is already in pre-order for print and ebook version at Amazon and Barnes & Noble. So yeah, this is a total shameless plug thing. I’m kinda an egomaniac, so that’s to be expected. And since you have to write what you know and I know myself well… it was the best way to get the characterization done. Two of the MC of my novel have a lot of me, but based on my different life outlooks at different ages, so one tends to act how I was at 25 yrs and the other after I reached my 30s. But the former is the one most based on me, that’s why, is tricky to say ‘I want said actor to portray him.’ I also realized that I was really annoying at 25. Learn more about Richard at RicardoVictoriau.com.